Several members of the Living Archives on Eugenics in Western Canada project have experienced some of the problems of attempting to get access to personal information from government institutions that create barriers to, or outright denials of, access to information by citing the need to protect the privacy of individuals to whom the information relates. All privacy legislation in Canada, whether federal or provincial, defines “personal information” as being information about an identifiable individual. There are many simple ways to alter records containing personal information, depending on the type of record and type of information, and this can and should be negotiated with researchers, many of whom have already factored privacy protections into their research as part of the ethics approval process. An interesting piece in last week’s New York Times focused on just these issues, although in the US. New rules affecting researchers dealing with sensitive medical information will offer the necessary privacy protections to subjects who participate in studies or whose information is otherwise made available to researchers. At the same time, researchers are concerned that the new rules will result in limited access to various types of valuable data, such as census data, marketing research, and various types of statistics. Typically, denials of access to such information are based on the premise that even when personal identifiers are removed from the information, individuals can potentially be identified by matching data obtained from other sources. While this may certainly be a legitimate issue, common sense should prevail when dealing with aggregate data, or with historical documents. Unfortunately, in Canada and the US alike, common sense doesn’t always factor into decision making, since denying researchers access to information is often the result of risk management by the institution holding the information, not wanting to be held liable for making mistakes. Usually, the best approach is to draft a research agreement between the researchers and the institution, shifting the responsibility for protecting privacy from the institution to the researchers. However, this depends entirely on the willingness of institutions to assist researchers in the first place. If they are not willing to assist in this way, it may be up to researchers to resort to using standard access to information processes to obtain information for research purposes. It is in this context that we should remember that access to information and protection of privacy go hand in hand, and both aspects should be considered together. Information relating to identifiable individuals belongs to those individuals, but information that is not identifiable belongs to the citizens, not to the government. And researchers are finding increasingly innovative ways to utilize information and transform it into new types of data that can be used to provide better government services, all with little to no risk of breaching anyone’s privacy when done properly. Institutions should be trying to find more innovate ways of getting such data into the hand of researchers, instead of creating unnecessary roadblocks. The first peek into Nick Green’s newest play. Undercovered documents the journey of several members of the Edmonton Police Force during the investigations into the Pisces Spa leading up to the infamous raid which took place on May 30th, 1981, an event that shook its way into Edmonton’s queer history. The further they dig, the more questions arise, probing into morality, privacy, and the subjectivity of the law. Are things really black and white? And how does the law function in the grey area? 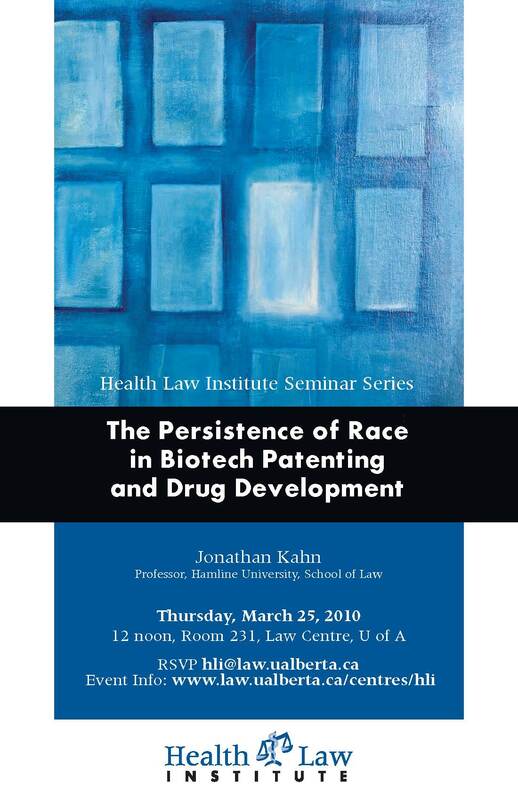 For those of you in the Edmonton area, the Health Law Institute at the U of A will be hosting a lecture on race and drug development on March 25th. Despite the fact that race as a topic of discussion seems to have fallen off the radar of many disciplines over the past few years, it remains a hotly debated topic in the medical sciences. It is astounding how poorly conceived the idea of race is, yet how widely accepted it remains. For example, the PBS program Faces of America traces the biological ancestry of 12 celebrities. In the episode that I saw last night, the discussion revolved around how accurately genetics can be used to determined which geographic racial group one belongs to, in terms of gene frequencies. Each of the celebrities was told how much, in percentages, of their genes came from Europe, Asia, or Africa. When using such broadly defined categories, how can an assessment not be accurate? As usual, these simple geographic referents became reduced to Black/White, with some reference to Asians and Native Americans being all the same. The most telling part of the program is when host’s genome had been decoded, and his genetic “profile” was revealed, which included discussion of the risk factors for various diseases that were determined by the analysis. The question asked was do you really want to know what diseases you might inevitably develop? If we can continue to convince people that they belong to artificial racial groups, then drug therapies can be marketed to greatest number of people where the risk factors for various diseases can be linked to racial groups. When we reduce human genetic variation to three basic categories, we get a wildly distorted view of how we actually differ biologically, and the real patterns that lie beneath the surface . The end result is selling people medications that they likely will not need. Matt Good has an interesting entry on his blog regarding the redevelopment of the Woodlands property in New Westminster, BC.